My favorite sit-com of all time is “Seinfeld”. This article is long over due. Seinfeld is one of those shows that has so many sub-plots that I’ve run into situations, when reminiscing with friends about our favorite scenes, where we find out at the end of the conversation that we’re talking about the same episode. Classic Seinfeld. Who could forget the “Festivus Miracle” or the “Marine Biologist”. So many memories. The funny thing is that the predicaments the characters find themselves in through each episode have the same pattern, though the supporting characters and specifics may change. Jerry is always dating someone who turns out to have some little quirk that he can’t get over. George is always scheming. Kramer always comes up with some crazy idea. 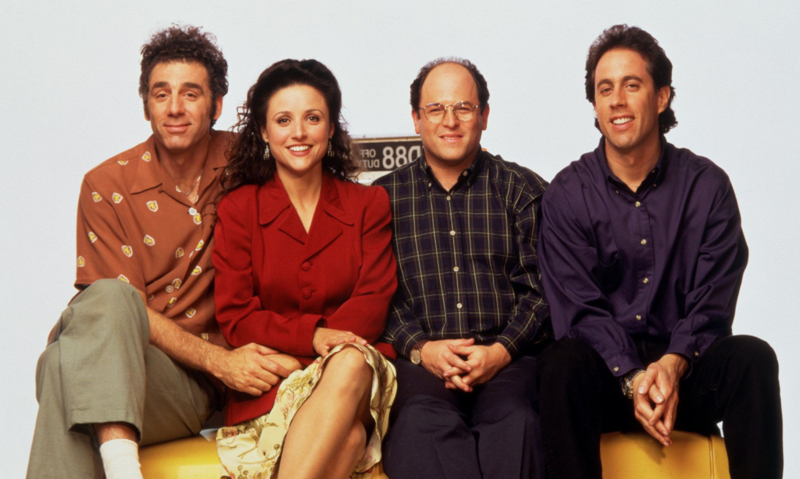 What, if anything, can “Seinfeld” teach us about Marketing? The Soup Nazi had a few things going right for him, namely…great soup. What made his soup kitchen unique however, was the customer experience. There was something unique about the experience, a sort of secret club where you had to know the rules in order to get the reward. This exclusivity brought with it a mystique, and gave his customers a reason to talk about his kitchen (beyond just talking about the product), making a great product taste even better. Lesson: Develop an expectation and deliver on it. This episode found all four main characters lost in a mall parking garage in New Jersey with Kramer carrying an AC unit he just purchased. The four of them wandered about the garage, but everything looked the same. Eventually Jerry and George were arrested for public urination. In terms of your customer’s user experience – how easy is it for your customers to navigate your website? Do you think Jerry and Kramer would shop at that mall again? Lesson: The easier your site is to navigate the better your conversion rates will be, and the better your chance of customer retention. After borrowing her boyfriend’s car, Elaine discovers that all of his radio presets were set to Christian Rock. She had been dating him for months and had no idea. When approached by Elaine, Puddy confirms that he is religious and is not concerned that Elaine isn’t, because as he puts it “I’m not the one going to hell.” How well do you really know your customers? Are you targeting one group and attracting another? Dig deeper than your product or service level and get to know your customers better. Use surveys or small talk, make notes in your CRM and look for patterns. You may be surprised what the information you collect tells you about your target. Lesson: Get to know your customers and what drives them. Use this information to make decisions relative to strategy and messaging. Elaine’s boss, J. Peterman, is writing an autobiography. The problem is that his stories aren’t that compelling, so he purchases Kramer’s stories for his own book. Peterman knew that for his business of hard-to-find clothing and accessories to grow, people needed to make an emotional connection with the brand’s spokesperson. Hard-to-find clothing needed hard-to-imagine content. Peterman didn’t have that type of content, so he purchased a series of Kramer’s stories for $750. Not everyone is blessed with the ability to write engaging content, but people that can are fairly easy to find and are in high demand. Don’t make up your stories, but do have an editor or a copy writer help polish your content. Good content gets shared, and when content is shared it is exponentially expanding your reach. Lesson: If you don’t have anyone in-house to write engaging content and help with messaging, find someone who can. This company is pretty good. Sometimes an idea seems so out there that we talk ourselves out of pursuing the idea by telling ourselves that there must be a reason why no one else has done it. Kramer had the idea to publish a coffee table book with pictures of coffee tables. The first person he talked to about it, Elaine, thought it was a terrible idea…but Kramer was persistent and eventually landed an interview with the Today Show. If the idea has “been done before” it is less risky; but, with risk comes reward. I could keep going – there are so many good episodes. Perhaps in a later post. Feel free to share your favorite episodes and/or lessons learned from Seinfeld. Jason Baumgartner is a founding partner at Brainstorm Creative, serving as an outsourced Brand Strategist and Chief Marketing Officer for Brainstorm clients throughout North America.